Seven years ago, when I first met Zabi, he was a lanky 18-year-old interpreter for John’s Construction, an Afghan company that built rudimentary buildings. Each morning, Zabi would arrive at an American military base with a group of construction laborers. His job was to stand at the building site and communicate between the Afghan foreman and the American engineers who supervised the projects. Compared to the laborers, Zabi’s job was a comfortable one. In 2009, Zabi spoke only rudimentary English, but that was all he needed to get by. 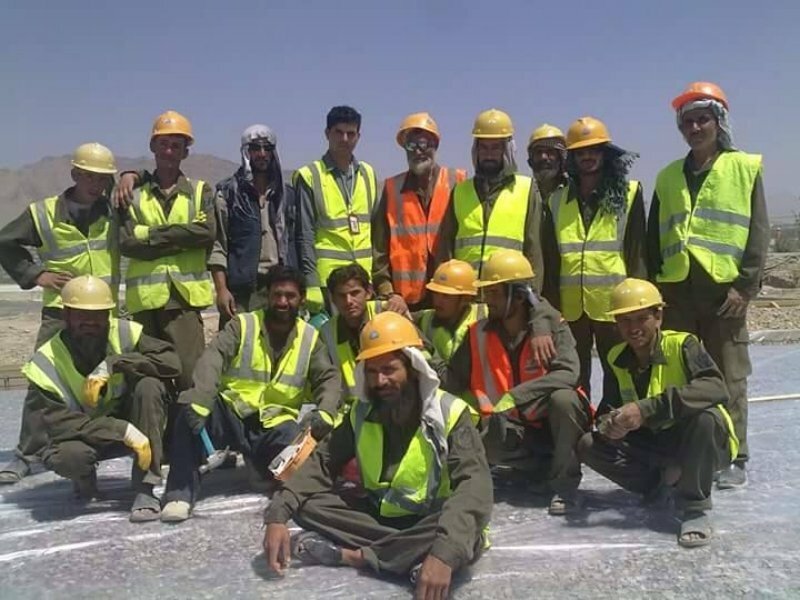 Zabi stands with a team of workers for Azrakhsh Construction in Afghanistan. Courtesy of Tim Patterson. For years, while the number of American military forces grew, the construction business boomed in Afghanistan. The U.S. military financed the building of thousands of barracks, offices, gyms, cafeterias, blast walls, and guard towers. They hired Afghan firms to build facilities for the Americans, for the Afghan National Army, and for Afghan police forces. Zabi worked on many of these projects. He worked alongside me at Camp Blackhorse in the suburbs of Kabul, and later he worked at the American base in Surobi, 50 miles farther east. Then, in 2013, the American military began to reduce the size of its presence in Afghanistan. Tens of thousands of American soldiers departed the country, and the Afghan construction boom—which had long been driven by American military dollars—stopped abruptly. Suddenly unemployed, Zabi returned to his village that sits near the eastern border with Pakistan. He married, and, in August 2014, his wife gave birth to a healthy baby girl. Not long after his daughter’s birth, the first night letter arrived. Zabi’s younger brother, the one who wakes up the earliest, found it. More than a year had passed since Zabi last worked with the American forces, but he took the threat seriously. He quietly departed his village alone and traveled to Kabul, where he began sleeping on the floor of a friend’s apartment. Without a job, he couldn’t afford to bring his wife and daughter with him, so they remained with Zabi’s father, who swore to protect them. Zabi searched for a job in Kabul, and after some months, he was hired as a staffer for the Afghan Ministry of Education. 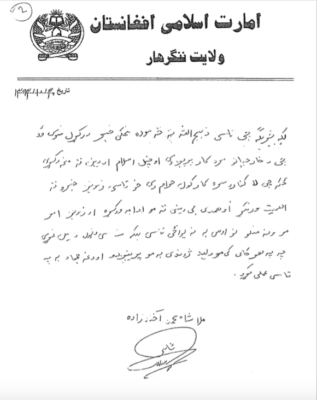 Today, two years after the first night letter, even Kabul doesn’t feel entirely safe to Zabi. He still keeps his precise location secret. American soldiers have all but disappeared from the province where Zabi grew up, and security conditions in his home district have worsened. Zabi has not felt safe visiting his home since 2014. When he does travel outside Kabul now, he tells his plans to no one but his wife or parents. Last September, Zabi sent me a photo of his friend Azatullah’s dead body. Azatullah, he told me, was stabbed in the heart with a knife. Azatullah had been Zabi’s best friend, and the two used to play cricket together. Zabi doesn’t know why Azatullah was killed, but he speculates the killers belong to either the Taliban or Daesh. 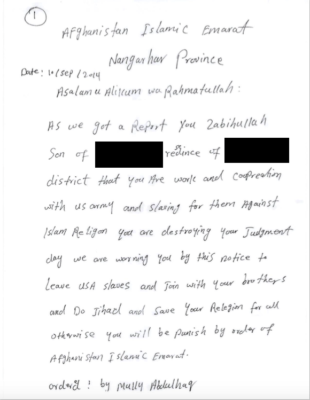 Zabi doesn’t know if Khan Mohammad or Azatullah received night letters too. He has told almost no one about the letters he’s received. For these reasons, Zabi doesn’t go home anymore. Instead, he tries to occasionally meet his wife in the eastern city of Jalalabad. Zabi feels safe taking taxis to Jalalabad only on Fridays, the Islamic holy day. On that day Afghan security forces stand guard along the main eastern roadway. On other days, he risks being stopped by a Taliban checkpoint. At his day job in the Ministry of Education in Kabul, Zabi works at an office computer where he handles information management, but his salary arrives infrequently. Zabi has thought about moving his wife and daughter to the relative safety of the capital, but an apartment for his family might cost $800 per month. And with what he’s making, he can’t afford it. Zabi hasn’t said a word about the night letters to his friends or neighbors in the village. One of them, he suspects, may be the sender. In Kabul, Zabi asked his most trusted friends what he should do. 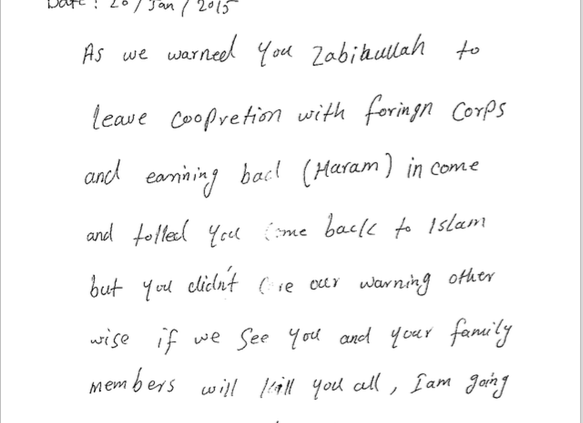 One of them, an Afghan who had worked closely with the U.S. military, told him to call the Americans. But Zabi doesn’t know any Americans very well, and the ones he once worked with in construction have all returned to the States. Too many years have passed since he last worked for John’s Construction. On January 9th, 2015, Zabi logged in to Facebook. He looked up the name of an American he’d met many years before, someone he’d worked with at Camp Blackhorse for no more than three months. He typed a desperate paragraph in clumsy English—and then he sent it to me. 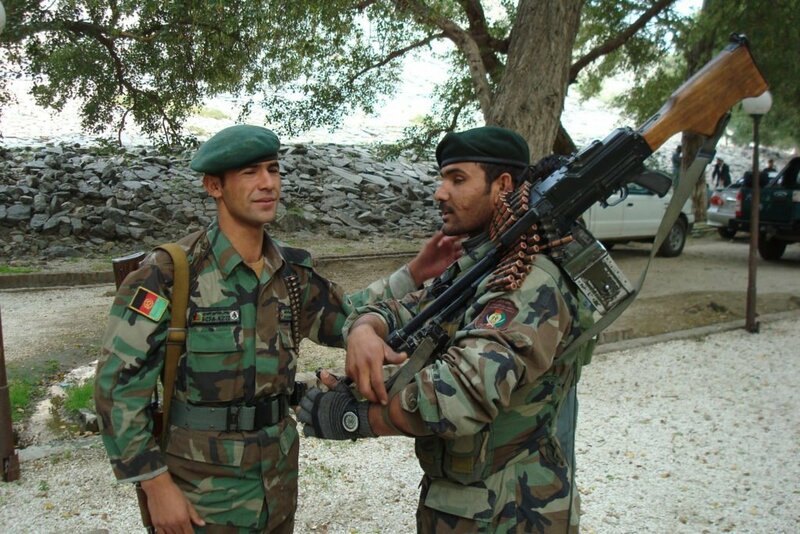 Systemic corruption within Afghan National Security Forces makes it impossible for Zabi to ask for help, he said. Courtesy of Tim Patterson. I ignored Zabi’s message for two weeks. I tried hard to not get involved, to keep myself emotionally separated from his problems. But with the immediate communication we had through Facebook, Zabi became difficult to block out. On January 26th, he wrote again. I’m ashamed at how long I took to finally answer. It was that last message that got me, “Friend I need help.” I asked Zabi to explain. I asked Zabi why he wrote to me and what he wanted. He told me I was the only American who still spoke to him, and I had only infrequently. He wanted me to write a letter of recommendation for his U.S. visa application. Zabi is still waiting for his visa. I expect it will never come. It has been a year and a half since Zabi first contacted me about the night letters. 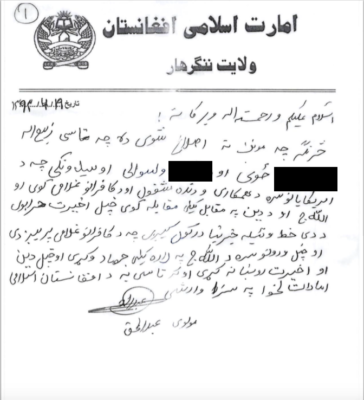 He’s still living in semi-secrecy in Kabul. We talk on Facebook about once a month. We never talk about anything important. I just keep checking that Zabi is still alive.